Your child will love learning about the interesting personalities and events that shaped his heritage as an American. The course’s emphasis on faith, patriotism, and moral conviction will make American history very meaningful for him. The inclusion of civics studies and projects will teach your child how the United States government operates and how to use the gift of political expression, which is so easily taken for granted in America. 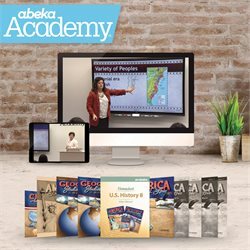 As he is enjoying the classroom experience, the exciting lessons from his history teacher from Abeka Academy will show him how God’s influence in people and nations determines their course in human history. He will also study geography, helping him to understand history even better because it tells us about the places where history has happened. As he becomes acquainted with the students on the video, he will feel as though he is a part of the class. The teacher will even pause to allow “classmates watching” opportunity to participate in reviews and drills.